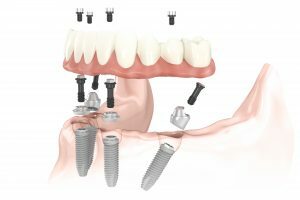 A dental implant replaces the tooth root and builds a stable foundation for replacement solutions for missing teeth. Implant dentures provide a high satisfaction of comfort for individuals looking to secure their dentures. 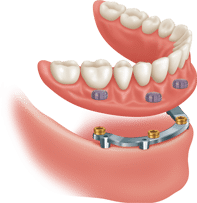 Although a conventional denture can still be fabricated, the best treatment plan to maintain bone and facial structure is with an implant retained denture. 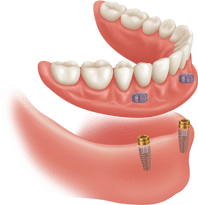 Implant dentures are the closest option to natural teeth and therefore so many individuals are opting for this treatment plan. Another advantage to placing implants is the maintenance of the surrounding bone. As a long time denture wearer bone loss will continue to occur following the extraction of natural teeth, with implants this bone will be maintained, preserving the facial structure. Use implants as fixed anchors and provides stability to full or partial dentures. You can still remove the prosthesis for cleaning. This solution provides a secure fit in the mouth, allowing better chewing and speaking function, with no need to use denture adhesive. Use implants as fixed anchors to securely fix the denture/bridge to. You cannot remove it yourself, and it provides several advantages compared to conventional dentures. Look and feel like natural teeth, while maintaining existing bone. All-on-4® dentures are becoming the treatment of choice for many individuals. If you have to have your remaining teeth extracted the all-on-4® treatment can be done similar to an immediate denture. Your natural teeth are extracted, and implants are placed the same day, your denture is then fixed to the implants allowing you to walk out with a fixed secure smile. This treatment option gives you the satisfaction of not having to remove dentures and chew the things you want.